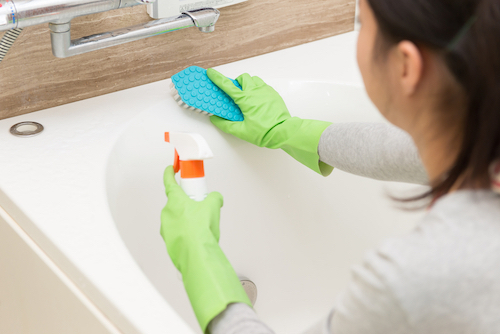 Ask anyone who tries to stay on top of bathroom cleaning — a big nemesis of every spotless shower installation is mold. Because it thrives in dark, damp conditions, mold loves wet spaces of the bathroom. That’s why practicing proper mold prevention is key. If you can understand and stop the growth of mold before it occurs, you can save yourself a lot of headaches and hassle in your regular bathroom upkeep. With that in mind, here’s a look at what you need to know. As great as it is to take daily showers/baths and use hot, running water, the downside of these pleasures is humidity. Humidity, especially without proper bathroom ventilation, creates a breeding ground for mold growth. That perpetually moist environment provides conditions for mold to thrive. Bathroom mold is more than unsightly. When you have mold around your bathtub installation, you have regular exposure to a hazardous material that can harm your health. Mold may contribute to allergic reactions, fungal infections, poisoning and other health issues. So while finding and treating mold is good, preventing its buildup in the first place is better — it protects you and your household from health risks. Most of the time, spotting mold isn’t difficult. You’ll see and/or smell it creeping into nooks and crannies of the bath/shower — or bathroom in general. If mold is not readily visible, it’s important to know where and how to look for it. Check hidden areas behind pipes, under the sink, around drains and even shower walls/curtains. Sometimes it will even show up on the moist bottoms of shampoo bottles and other bath/shower items. When dealing with mold, always wear gloves and a mask, if possible. Open windows and doors in the bathroom area to help with ventilation. Using a brush and a strong cleaning solution, scrub and clean the problem areas. Some possible cleaning solutions include undiluted vinegar; a mix of borax, ammonia and baking soda; a mixture of detergent and water; or a solution of one part bleach to nine parts water. Install and/or use a fan. Every time you shower or bathe, use the exhaust fan to help with ventilation. Likewise, if you can open a window and/or door, do so. Then, for an additional 30 minutes after bathroom use, keep the fan running to help the space dry. Squeegee walls after every shower use. Every time you take a bath or shower, squeegee excess water off the walls. Minimizing water accumulation helps to curb the potential for mold and mildew growth. Swap shower curtains often. Find a mildew-resistant shower curtain, and replace it — or thoroughly wash and dry — often. Minimize “stuff.” The more bathroom items you keep in or near your shower/tub, the more potential hiding places for moisture. Work to limit toiletries and other items in the shower/tub area in order to reduce places for mold to grow. The good news about dealing with bathroom mold is … there are things you can do to prevent or eliminate it. Use the tips above to get better control of your bathroom cleaning, and say goodbye to mold for good.